The holly berry plant was once believed to ward off evil from one's home. But now, it's considered an almost universal symbol of Christmas. 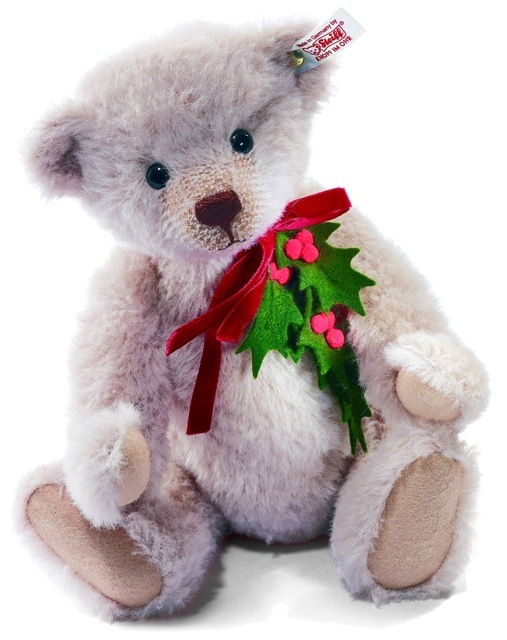 Steiff's Holly Teddy wears a sprig of beautiful felt holly tied around her neck with the softest velvet ribbon. Crafted by hand in Germany, this special decoration will impress you with its intricate detail - careful stitching and delicate airbrushing. 12 inch Holly is a five-way jointed bear and made of sand-colored alpaca. Make sure your collection is complete - add the Holly Teddy to your assortment before it's too late. A Worldwide edition. • Ear tag: White tag; gold-plated "Button in Ear"
Condition: New - complete with Steiff box, Certificate of Authenticity and shipping sleeve. We are a smoke free establishment.